Search our database for all your cooker spare needs, you can use either official part numbers, cooker model numbers and any relevant keywords to narrow down your search. Free delivery available on this item. Replaces like for like with no modification required. Suitable for Natrual Gas Appliances. This part is suitable for natural gas cookers only. 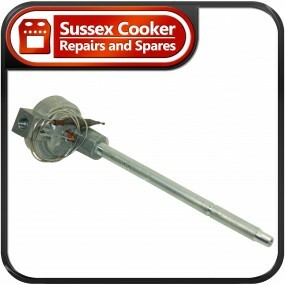 Stoves Genuine Flame Failure Device (FSD / FFD) will fit many Stoves models listed. If you cannot see your corresponding model then please contact us with your model number and we can verify the parts suitability. This part replaces the Flame Failure Device (also known as the flame supervision device) which is used to terminate the gas supply to the oven in the event that the flame fails. The typical symptom for a faulty Flame Failure Device (FSD) is that the oven will ignite but the flame will not rise to the full height as you would normally expect after 15-45 seconds. Therefore you will experience the oven not heating correctly or reaching the desired temperature. We welcome you to Email us through eBay or call on +44 (0) 1273 420134 if you are unsure or need verification that item is correct for your appliance. In order for us to help your inquiry we ask that you have the model number of the appliance to hand when calling. The model number for Hotpoint cookers is a 10 digit number is located in bottom plinth or inside the bottom storage compartment. We have a wealth of expertise on Hotpoint cookers as well as other models; Gas and Electric so do please contact us for advice. We are very experienced at helping all levels of competence and endeavour to understand your needs and to use language you can understand. We can also supply most Flame Failure Devices (including Thermal Couples) for all British and Continental Gas Cookers, including Natural Gas and LPG, from stock. Please contact us with the make and model for details.